Modern networks are easy to install – but hard to install properly. This is why you must get a professional involved every time. As your business grows, there’s a real sense of urgency. To ensure the quickest return on investment and shortest time to productivity, you want people and systems in place as soon as possible. This “organic” growth is brilliant for bringing products and services to market quickly – but in some cases it can create longer-term issues. This is especially true of your company network. It may be that some of the problems you experience with IT are caused by decisions you took some years ago. In our experience there are two mistakes commonly made by UK SMEs – the descent into chaos, and the organic spaghetti. When your business moved into its latest premises, there’s a very good chance that you had the building cabled correctly. You probably hired a professional network installer or IT consultancy to run cables, install network cabinets and configure hardware to deliver optimal performance. All new cables would have been run along walls in trunking, and in trays under desks and work surfaces. There wouldn’t have been a trailing cable in sight, all wall ports were neatly labelled, and the network cabinets terminated correctly to allow easy access to the switches inside. 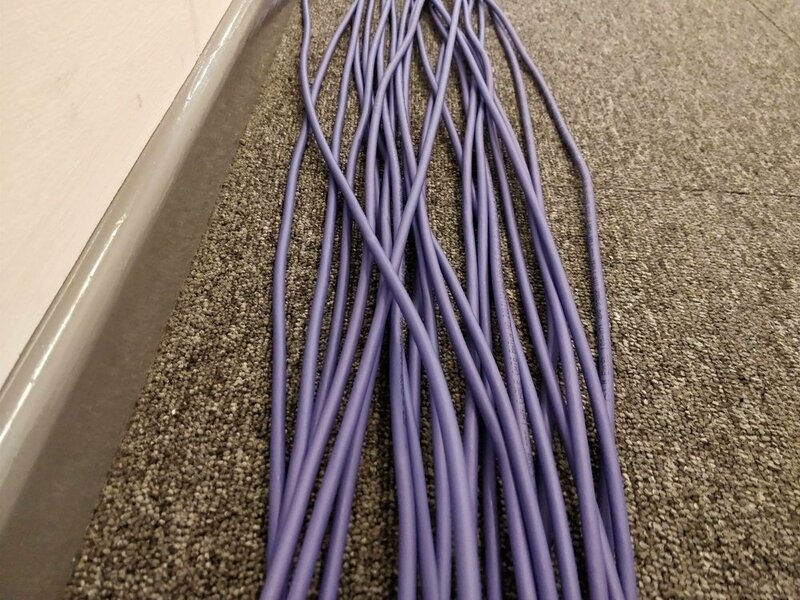 But as you connected more PCs and printers, one of your employees will have draped cables around the office to make a connection quickly. The same is true of your network cabinet; someone adds a few new patch cables that are too long, and not labelled, preventing easy access to switches and ports. You always planned to tidy the cabling up when you had a chance – but that chance still hasn’t happened. The Descent Into Chaos wasn’t deliberate – it just “happened”. Unlike the Descent Into Chaos, the Organic Spaghetti never had any order to start with. The rush to get a network up-and-running means that every corner is cut, there are cables trailed around the edges of rooms, hanging loose under desks and jamming up the network cabinets. You have no chance of finding both ends of a cable, making network troubleshooting a long and disruptive process. And because resolving all that mess will take ages, most businesses delay the clean-up process. Forever. A professional installation ensures that every cable is labelled and documented. When you encounter problems in future, troubleshooting is greatly simplified because you know which cables to look at. Trailing cables are easily stretched or broken, instantly affecting network connectivity. Simply tidying cables up reduces the risk of failure and increases network uptime. If your network resembles a bowl of spaghetti, identifying and fixing issues takes much, much longer. Every minute that your network is down costs you money. The time saved by a quick-n-dirty cable run will cost you in the long run. A professional network consultancy will also provide advice and guidance for the cables and hardware they install. The additional investment will more than pay for itself over time.